San Francisco State University (SFSU) has fostered a "pervasively hostile" environment for Jewish and Israeli students despite several complaints filed with the school over the past nine months, according to attorneys for seven plaintiffs who say they have faced discrimination on campus. In an amended federal lawsuit filed against the university on Friday, the Lawfare Project, a non-profit pro-Israel legal think tank, charged that SFSU "knowingly and intentionally discriminated against Jewish and Israeli students and community members, and failed to protect their civil rights and physical safety." The plaintiffs allege that school administrators have done nothing to respond to increasing threats against students since legal proceedings began in June. The amended complaint augments earlier charges under California's Public Records Act that SFSU refused to release detailed findings of an investigation looking into one of the instances of discrimination in violation of the U.S. Civil Rights Act. Shachar Ben-David, a veteran of the Israeli Defense Forces and the latest plaintiff in the case, contends the university "repeatedly ignored and belittled" the harassment she and her peers faced on campus. Ben-David says she alerted several faculty members of threatening posts written on Tumblr by her classmate and president of the General Union of Palestinian Students (GUPS), Mohammad Hammad, "describing his desire to set children on fire, radicalize his classmates, join Palestinian terrorist organizations, and behead Israeli soldiers." The amended complaint claims that the university responded by removing Ben-David from the classroom for an exam and offering her psychological counseling, rather than disciplining or removing Hammad. "As a former member of the IDF, I was horrified and terrified when I found out that one of my classmates had expressed a desire to kill Israeli soldiers," Ben-David said in a statement. "The university did nothing to protect me, and in fact left me even more vulnerable by declaring that Hammad was suspended or expelled when, in actuality, he was still a student at SFSU." Mary Kenny, an SFSU spokesperson, said the school was unable to comment on the case "in light of the pending litigation and the confidentiality of student records." The complaint also alleges that SFSU has continued to withhold the findings of a report that examined the university's decision to bar the Jewish Hillel center from an on-campus 2017 human rights fair. The amendments come after a federal judge declared in November that the scope of the lawsuit was overly broad. 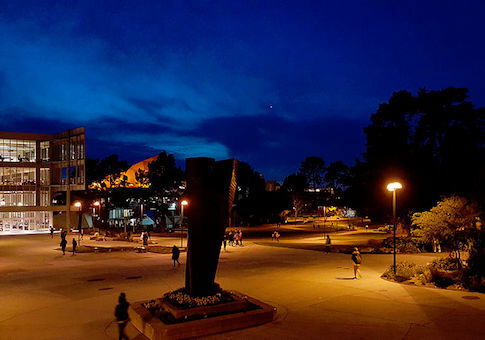 The original lawsuit names Rabab Ibrahim Abdulhadi, who heads SFSU's Arab and Muslim Ethnicities and Diasporas program, as the primary perpetrator of the anti-Jewish sentiment on campus. Most recently, Abdulhadi, who oversees GUPS, posted a message to an official SFSU Academic Center Facebook page in February contending the existence of Zionist students on campus is a "declaration of war." In the nine months since litigation began, flyers, posters, and chalked statements declaring "Zionists are not welcome" and "Zionists support genocide" have appeared on SFSU's central quad. Amanda Berman, co-counsel for the plaintiffs and director of legal affairs at the Lawfare Project, said the amended complaint reflects a "deteriorating environment" for Jewish students, many of whom she says are now "terrified" to walk across campus. "Jewish students who hold Zionism as an intrinsic part of their identity feel that they're not welcome on a public university campus where they are paying to matriculate," Berman told the Washington Free Beacon. "They tuck in Jewish stars and Yarmulkes, they don't wear Jewish fraternity letters, and it's just a sad state of affairs." The Lawfare Project has also filed a separate state complaint directly against SFSU and the Board of Trustees at California State University under the state's civil rights laws.